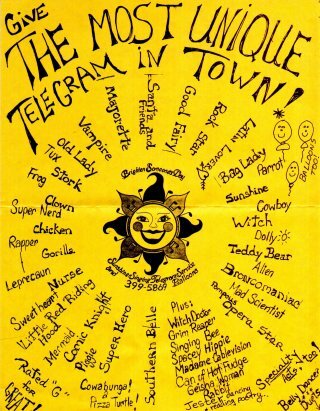 Old Time Telegram Messages don't exist anymore, so we are now providing that service for $30. Read aloud or performed for $60. Several examples include telegrams read at funerals and announcements of a birth, pregnancy, new job, wedding, etc. Examples of Singing Telegram Videos Singing Telegram $80.00 Live Performance in the Denver metro area! Tales from the Bright Side!! Parties, Events & Holidays ?? Practice Random Acts of Kindness!! Saving the US economy one telegram at a time! We have delivered at least 10,000 telegrams and climbing! We can also send out telegrams in quite a few other cities! Call for details. Prices will vary. Special Right NOW!! Phone-gram for $30.00 delivered ANYWHERE IN THE WORLD!!!!! Anytime is the right time to tell someone "you are my sunshine."